The hill on which Jesus preached the Sermon on the Mount was near the Sea of Galilee, and this provides a lovely setting here, with seabirds enliving the sky above. 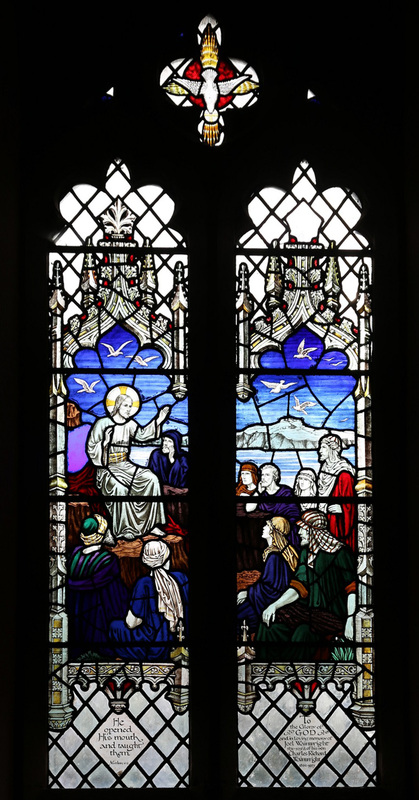 Although this beautiful window near the pulpit is a later one, Nicholson was "a member of Sedding's and Wilson's circle" ("History and Heritage"), and his contribution to their work harmonises well with the Arts and Crafts spirit of the church. Photograph by Michael Critchlow; text and formatting by Jacqueline Banerjee. "History and Heritage of St Martin's Church." St Martin's Low Marple Heritage Trust. Web. 9 September 2106.